Our 150th year is upon us. As a small club, fundraising is always an effort. We had a lively annual dinner in the historic social home of the club, the Neeld Arms, last night – and will raise some £300.00 from that event. But, much more significantly, we have secured the first major sponsor for GCC150. Grafton Jones, an accountancy firm in the Chippenham, Keynsham and Bristol areas, has strong connections with the club, and Trudy Josey, their financial director, presented a cheque for £500 to Andrew Carrington, the outgoing club Chairman at the dinner. We have also received a significant donation of £400 from another company with strong links to the club: SCISYS – a Chippenham based software company. What are we going to spend this money on? 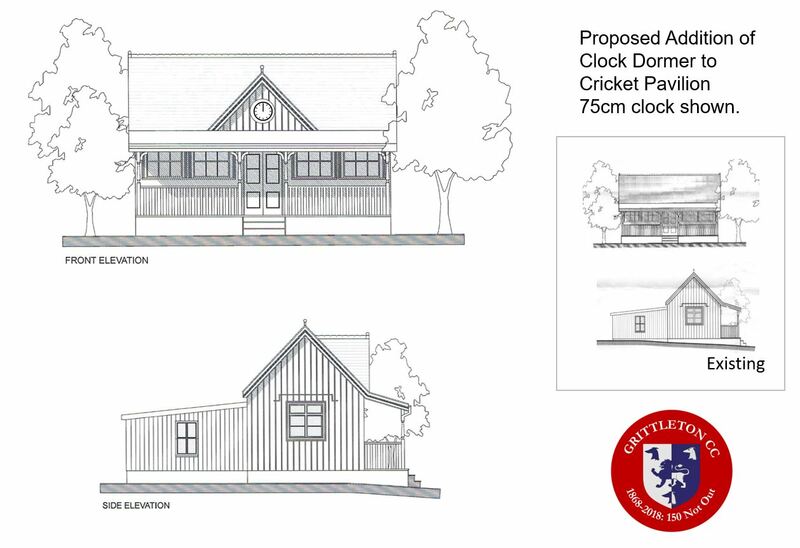 Our main target is to add a sympathetic dormer and clock to our pavilion, which is itself over 100 years old. We now have some initial plans drawn up by one of our ex-players and captains, “Binary” Inchley, who we bribed with a portion of toad-in-the-hole and a pint of bitter to design and draw up the plans as shown below – let us know what you think.. Things are happening, momentum gaining, stay tuned, get involved…. Happy new year – GCC have been busy planning and advertising the events for it’s sesquicentennial celebrations (yes, there is such a word!). We have also been researching and writing up the clubs history, which we will post here as it gets tidied up. As well as having fun celebrating we are looking to commemorate the event by placing a “proper” clock on the Pavilion, do some proper signage and hopefully rebuild some of the tired interiors and exteriors of the pavilion. To do this we need to raise some funds (around £5,000) so we have included some fundraising amongst our events. We are also pleased to announce that we will be hosting a fixture from another club who are celebrating 150 years this year: Stanton-by-Dale, on Sunday 22nd July. With the support of the club and the village we can make this a year to remember and one that is looked back on in 50 years at the GCC 200th.